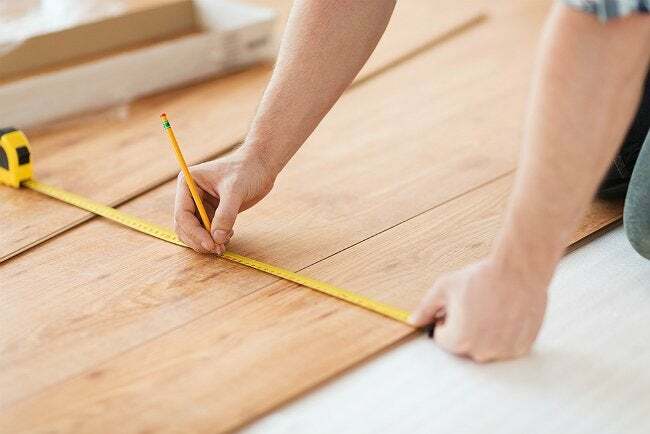 Accurate measurement is fundamental to any successful DIY project. Remember to choose the right tools, mark precise points, and keep perspective on just how accurate is accurate enough. Don’t use a 25-foot tape to measure for a 6-inch cut. Better to use a smaller tape that’s easier to manipulate. To transfer your measurements to the surface of the material you’re cutting, first press on the edge of the tape and roll it until the edge makes contact with the material. Then put the point of your pencil at the measurement and flick it up and to the right, then up and to the left. That’ll give you a mark that’s very visible yet small enough at the point to maintain accuracy. Also, keep a clear perspective on how accurate your measurements really need to be. For example, if you’re cutting drywall, a quarter-inch gap isn’t gonna make a big difference. You can always cover it with tape and mud. It’s the same with trim you’re planning to paint. A little caulk goes a long way. For clear-finish woodwork, though, you’ll need to be more precise.